Award-winning author, Lena Nelson Dooley, has more than 675,000 books in print. 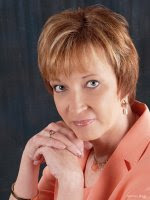 She is a member of American Christian Fiction Writers http://www.acfw.com/ and president of the local chapter, DFW Ready Writers. 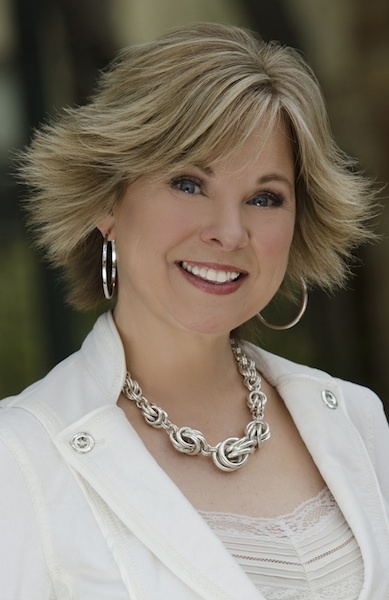 She’s also a member of Christian Authors Network, CROWN Fiction Marketing, and Gateway Church in Southlake, Texas. Lena loves James, her children, grandchildren, and great grandson. She loves chocolate, cherries, chocolate-covered cherries, and spending time with friends. Travel is always on her horizon. Cruising, Galveston, the Ozark Mountains of Arkansas, Mexico. One day it will be Hawaii and Australia, but probably not the same year. Helping other authors become published really floats her boat, with fifteen signing their first book contract after her mentoring. 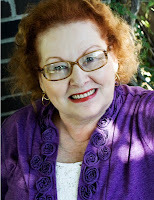 Three of her books have been awarded the Carol Award silver pins from American Christian Fiction Writers and she has received the ACFW Mentor of the Year award at their national conference. The high point of her day is receiving feedback from her readers, especially people whose lives have been changed by her books. And she loves chocolate, especially dark chocolate. Her last release is Love Finds You in Golden, New Mexico, from Summerside Press recently won the Will Rogers Medallion Award for excellence in publishing western fiction. Lena is currently under two 3-book contracts with Charisma House/Realms. In addition to her writing, Lena is a frequent speaker at women’s groups, writers groups, and at both regional and national conferences. She has spoken in six states and internationally. 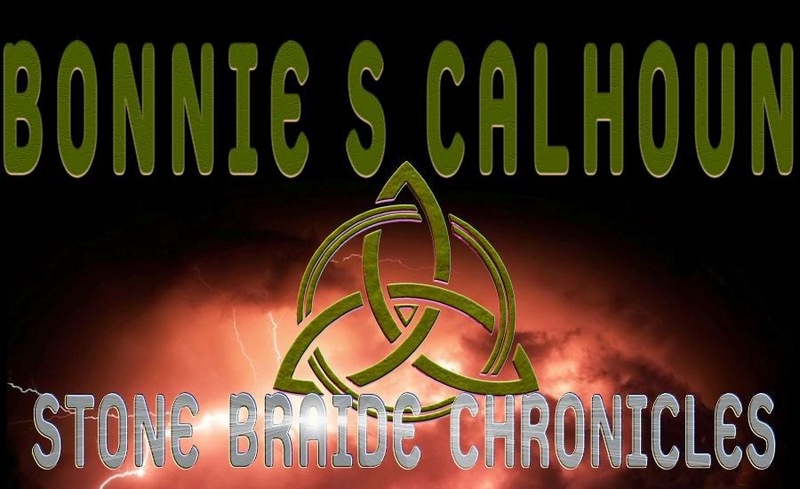 Lena has an active web presence on Shoutlife, Facebook, Twitter, Goodreads, and with her internationally connected blog where she interviews other authors and promotes their books. 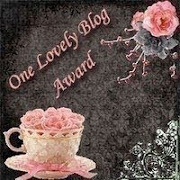 You can check out her books and find out more about her on her blog. Near her eighteenth birthday, Margaret Lenora Caine finds a chest hidden in the attic containing proof that she's adopted. The spoiled daughter of wealthy merchants in Seattle, she feels betrayed by her real parents and by the ones who raised her. But mystery surrounds her new discovery, and when Maggie uncovers another family secret, she loses all sense of identity. Leaving her home in Seattle, Washington, Maggie strikes out to find her destiny. Will Charles Stanton, who's been in love with her for years, be able to help her discover who she really is? 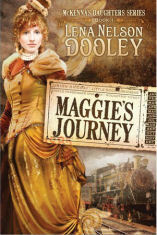 If you would like to read the first chapter of Maggie's Journey, go HERE. Bruce Hennigan was born and raised in the isolated countryside of Shreveport, La., a place full of possibilities for the active mind of a young boy. The fertile imagination he cultivated while playing deep in the Louisiana woods would lead to a lifelong love of creative writing. 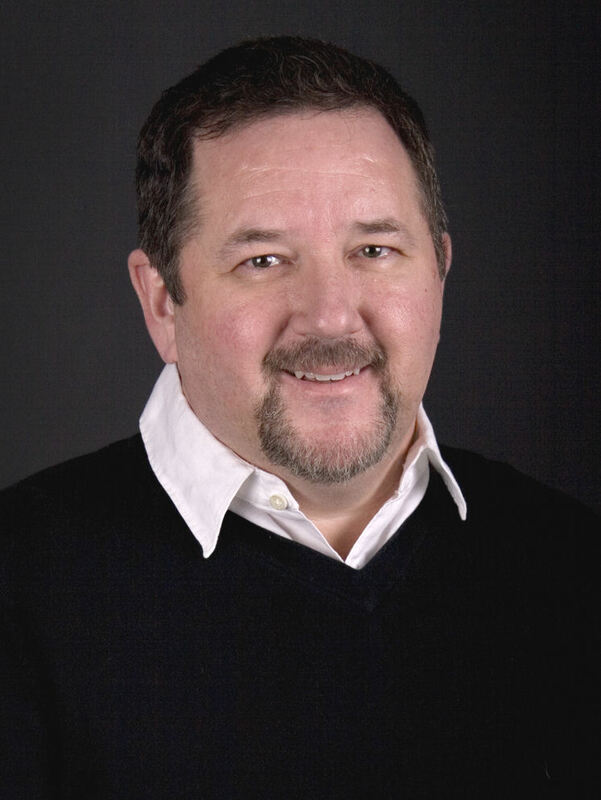 In 2006, Hennigan pursued the Certified Apologetic Instructor Certificate from the North American Mission Board of the Southern Baptist Convention. He has become a frequent speaker at regional and state events on apologetics and his strong point is in making these sometimes hard to understand issues easily approachable for the average Christian. 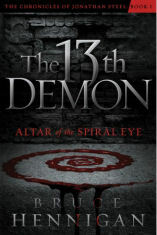 Hennigan’s experience in apologetics inspired him to write his new novel, The 13th Demon: Altar of the Spiral Eye, a supernatural Christian thriller that combines science and faith. Now, combining his love for apologetics and his love for the art of writing, Hennigan is pursuing a career as the “Michael Crichton” of Christian fiction building powerful, fast paced stories around the truths of Christian apologetics. Hennigan currently resides in Shreveport with his wife and daughter. He continues to write and to practice radiology at the Willis Knighton Health Care System. He has secured Jeff Jernigan of Hidden Value Group (www.hiddenvaluegroup.com) as his literary agent and has signed a five book deal with the Realms imprint of Charisma Media for “The Chronicles of Jonathan Steel”. When Jonathan Steel wakes up on a beach in a raging thunderstorm, naked, beaten, and bleeding, he has no idea who he is or how he got there. But just as he starts to make progress in his slow journey to recovery, tragedy strikes again, taking everything in his new life that he has come to love and rely on. Filled with rage and a thirst for revenge, he searches the countryside for the entity responsible—an entity called only the Thirteenth Demon. His quest brings him to Lakeside, Louisiana, and a small country church where evil is in control and strange writing on the walls, blood-soaked floors, and red-eyed spiders have appeared in the sanctuary. As he faces the final confrontation with an evil presence that has pursued him all of his life, he must choose between helping the people he loves or destroying the thirteenth demon. If you would like to read the first chapter of The 13th Demon, go HERE. Special Agent Meghan Connors’ dream of one day protecting the president of the United States is about to come true. Only one assignment stands in her way. After the vice president’s rebellious daughter is threatened, Meghan is assigned to her protective detail on a secluded ranch in West Texas. Unfortunately, working with Special Agent in Charge Ash Zinders may be as tough as controlling her charge. Ash has a reputation for being critical and exacting, and he’s also after the same promotion as Meghan. But when the threats escalate and security on the ranch is breached, it becomes clear this isn’t the work of a single suspect—it’s part of a sophisticated plan that reaches deeper and higher than anyone imagined. And only Ash and Meghan can put the pieces together before it’s too late. 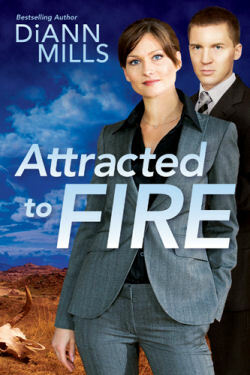 If you would like to read the first chapter of Attracted to Fire, go HERE. For many years, Lynn Austin nurtured a desire to write but frequent travels and the demands of her growing family postponed her career. When her husband's work took Lynn to Bogota, Colombia, for two years, she used the B.A. she'd earned at Southern Connecticut State University to become a teacher. After returning to the U.S., the Austins moved to Anderson, Indiana, Thunder Bay, Ontario, and later to Winnipeg, Manitoba. It was during the long Canadian winters at home with her children that Lynn made progress on her dream to write, carving out a few hours of writing time each day while her children napped. Lynn credits her early experience of learning to write amid the chaos of family life for her ability to be a productive writer while making sure her family remains her top priority. Extended family is also very important to Austin, and it was a lively discussion between Lynn, her mother, grandmother (age 98), and daughter concerning the change in women's roles through the generations that sparked the inspiration for her novel Eve's Daughters. Along with reading, two of Lynn's lifelong passions are history and archaeology. While researching her Biblical fiction series, Chronicles of the Kings, these two interests led her to pursue graduate studies in Biblical Backgrounds and Archaeology through Southwestern Theological Seminary. She and her son traveled to Israel during the summer of 1989 to take part in an archaeological dig at the ancient city of Timnah. This experience contributed to the inspiration for her novel Wings of Refuge. Lynn resigned from teaching to write full-time in 1992. Since then she has published twelve novels. 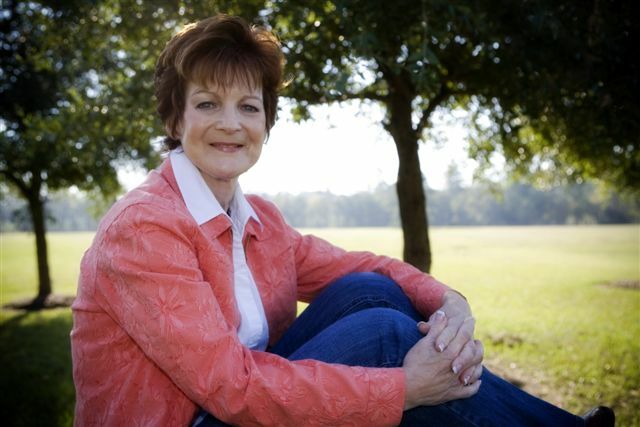 Five of her historical novels have won Christy Awards in 2002, 2003, 2004, 2008, and 2009 for excellence in Christian Fiction. And two of her inspirational fiction books were chosen by Library Journal for their top picks in 2003, and 2005. One of Lynn's novels has been made into a movie for the Hallmark Channel, starring actress Shirley Jones. Ms Jones received a 2006 Emmy Award nomination for her portrayal of Aunt Batty in the film. Alice Grace Ripley lives in a dream world, her nose stuck in a book. But happily-ever-after life she's planned on suddenly falls apart when her boyfriend, Gordon, breaks up with her, accusing her of living in a world of fiction instead of the real world. Then to top it off, Alice loses her beloved job at the library because of cutbacks due to the Great Depression. Fleeing small-town gossip, Alice heads to the mountains of eastern Kentucky to deliver five boxes of donated books to the library in the tiny coal-mining village of Acorn. Dropped off by her relatives, Alice volunteers to stay for two weeks to help the librarian, Leslie McDougal. But the librarian turns out to be far different than she anticipated--not to mention the four lady librarians who travel to the remote homes to deliver the much-desired books. While Alice is trapped in Acorn against her will, she soon finds that real-life adventure and myster--and especially romance--are far better than her humble dreams could have imagined. If you would like to read the first chapter of Wonderland Creek, go HERE. After a short career in elementary education, Deeanne Gist retired to raise her four children. Over the course of the next fifteen years, she ran a home accessory and antique business, became a member of the press, wrote freelance journalism for national publications such as People, Parents, Parenting, Family Fun, Houston Chronicle and Orlando Sentinel, and acted as CFO for her husband’s small engineering firm--all from the comforts of home. Squeezed betwixt-and-between all this, she read romance novels by the truckload and even wrote a couple of her own. While those unpublished manuscripts rested on the shelf, she founded a publishing corporation for the purpose of developing, producing and marketing products that would reinforce family values, teach children responsibility and provide character building activities. After a few short months of running her publishing company, Gist quickly discovered being a "corporate executive" was not where her gifts and talents lie. In answer to Gist’s fervent prayers, God sent a mainstream publisher to her door who licensed her parenting I Did It!® product line and committed to publish the next generation of her system, thus freeing Gist to return to her writing. Eight months later, she sold A Bride Most Begrudging to Bethany House Publishers. Since that debut, her very original, very fun romances have rocketed up the bestseller lists and captured readers everywhere. Add to this two consecutive Christy Awards, three RITA nominations, rave reviews, and a growing loyal fan base, and you’ve got one recipe for success. Her latest releases, Beguiled, Maid To Match, and Love on the Line are now available. Gist lives in Texas with her husband of twenty-eight years and their border collie. They have four grown children. Click here to find out the most up-to-the-minute news about Dee. Rural switchboard operator Georgie Gail is proud of her independence in a man's world ... which makes it twice as vexing when the telephone company sends a man to look over her shoulder. Dashing Luke Palmer is more than he appears though. He's a Texas Ranger working undercover to infiltrate a notorious gang of train robbers. Repairing telephones and tangling with this tempestuous woman is the last thing he wants to do. But when his stakeout puts Georgie in peril, he realizes more than his job is on the line. 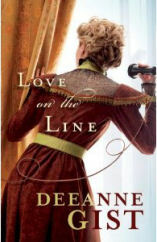 If you would like to read the first chapter of Love on the Line, go HERE. Patti Lacy, Baylor graduate, taught community college humanities until God called her to span seas and secrets in her novels, An Irishwoman's Tale and What the Bayou Saw. The secrets women keep and why they keep them continue to enliven Patti's gray matter. A third book, The Rhythm of Secrets, released in January of 2011. Patti's, Reclaiming Lily, documents a tug-of-war between a Harvard-educated doctor and an American pastor and his wife for a precious child and explores adoption issues, China's "One Child" policy, and both Christian and secular views of sacrifice. Patti also facilitates writing seminars in schools, libraries, and at conferences and has been called to present her testimony, "All the Broken Pieces," at women's retreats. She also leads a Beth Moore Bible study at her beloved Grace Church and has had a blast planning the September 2009 wedding of her firstborn, Sarah. Patti and her husband Alan, an Illinois State faculty member, live in Normal with their handsome son Thomas, who attends Heartland Community College. On sunny evenings, you can catch the three strolling the streets of Normal with their dog Laura, whom they've dubbed a "Worchestershire Terrier" for her "little dab of this breed, a little dab of that breed." A storm the size of Texas brews when Gloria Powell and Kai Chang meet in a Dallas hotel. They have come to discuss the future of Lily, the daughter Gloria adopted from China and the sister Kai hopes to reclaim. Kai is a doctor who had to give up her little sister during the Cultural Revolution and has since discovered that an inherited genetic defect may be waiting to fatally strike Lily. Gloria's relationship with her daughter is tattered and strained, and the arrival of Kai, despite the woman's apparent good intentions, makes Gloria fearful. Gloria longs to restore her relationship with Lily, but in the wake of this potentially devastating diagnosis, is Kai an answer to prayer...or will her arrival force Gloria to sacrifice more than she ever imagined? 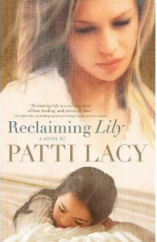 If you would like to read the first chapter of reclaiming Lily, go HERE. Alice was born in Osaka, Japan in the sixties. Her parents were Presbyterian career missionaries. As a young child, Alice loved to walk down to the local stationer's store to buy notebooks, pencils and scented erasers. In her room, she created stories. The desire to be a published famous author has never left her. Well, two out of three isn't bad. 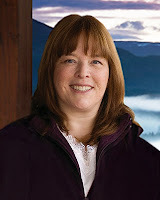 She's the author of Rain Song, How Sweet It Is, Hatteras Girl and A Wedding Invitation (all published by Bethany House). Alice went to Eastern Mennonite University after graduating from Canadian Academy, an international high school in Kobe, Japan. She majored in social work and has worked across the U.S. in that field. She taught ESL (English as a Second Language) in Japan and at a refugee camp in the Philippines. She also studied Spanish at a language institute in San Jose, Costa Rica. She has four children--Rachel, Daniel, Benjamin and Elizabeth. Daniel died on 2/2/97 from cancer treatments at the age of four. Since then, Alice founded Daniel's House Publications in her son's memory. This organization reaches out to others who have also lost a child to death. In 2000 and 2003, Alice compiled recipes and memories of children across the world to publish two memorial cookbooks, Slices of Sunlight and Down the Cereal Aisle. After returning home from teaching English at a refugee camp in the Philippines, Samantha Bravencourt enjoys her quiet life working at her mother's clothing boutique in Falls Church, Virginia. When she receives an invitation to a wedding in Winston-Salem, North Carolina, she looks forward to reconnecting with her college friend. Instead her life collides with Carson, a fellow teacher and the man who broke her heart, and a young Amerasian refugee named Lien who needs Samantha and Carson's help to find her mother before Lien's own wedding. When the search for Lien's mother reveals surprising secrets from the past, Samantha must reevaluate her own memories and decide whether to continue to play it safe or take a risk that could change her life. 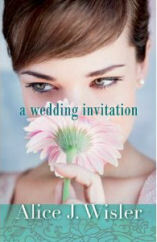 If you would like to read the first chapter of A Wedding Invitation, go HERE. 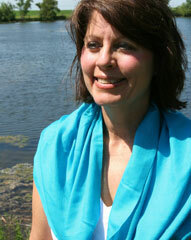 Tracie Peterson is the bestselling, award-winning author of more than 85 novels. She received her first book contract in November, 1992 and saw A Place To Belong published in February 1993 with Barbour Publishings' Heartsong Presents. She wrote exclusively with Heartsong for the next two years, receiving their readership's vote for Favorite Author of the Year for three years in a row. In December, 1995 she signed a contract with Bethany House Publishers to co-write a series with author Judith Pella. 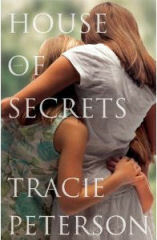 Tracie now writes exclusively for Bethany House Publishers. She teaches writing workshops at a variety of conferences on subjects such as inspirational romance and historical research. Tracie was awarded the Romantic Times Career Achievement Award for 2007 Inspirational Fiction and her books have won numerous awards for favorite books in a variety of contests. Making her home in Montana, this Kansas native enjoys spending time with family--especially her three grandchildren--Rainy, Fox and Max. She's active in her church as the Director of Women's Ministries, coordinates a yearly writer's retreat for published authors, and travels, as time permits, to research her books. When her father orchestrates a surprise trip to the summer house of her childhood, Bailee Cooper is unprepared for what follows. What is intended to be a happy reunion for Bailee and her sisters, Geena and Piper, quickly becomes shrouded by memories from the past. Together again, the three sisters sift through their recollections of fifteen years ago...of an ill mother, and of their father making a desperate choice. They vowed, as children, to be silent--but one sister believes the truth must now be revealed. Yet can they trust their memories? Mark Delahunt arrives in the wake of this emotional turmoil. Determined to win Bailee's affection, Mark becomes the strong fortress for her in this time of confusion, and what was once a tentative promise begins to take root and grow. Caught between the past and an uncertain future, can Bailee let God guide her to heal the past and ultimately to embrace love? If you would like to read the first chapter of House of Secrets, go HERE. Booksellers across the country, and around the world, have spread the word of Beverly's tender tales of Plain country life. 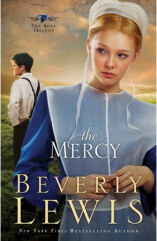 A clerk in a Virginia bookstore wrote, "Beverly's books have a compelling freshness and spark. You just don't run across writing like that every day. I hope she'll keep writing stories about the Plain people for a long, long time." A member of the National League of American Pen Women, as well as a Distinguished Alumnus of Evangel University, Lewis has written over 80 books for children, youth, and adults, many of them award-winning. She and her husband, David, make their home in Colorado, where they enjoy hiking, biking, and spending time with their family. They are also avid musicians and fiction "book worms." Rose Kauffman pines for prodigal Nick Franco, the Bishop's foster son who left the Amish under a cloud of suspicion after his foster brother's death. 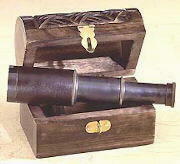 His rebellion led to the "silencing" of their beloved Bishop. But is Nick really the rebel he appears to be? Rose's lingering feelings for her wayward friend refuse to fade, but she is frustrated that Nick won't return and make things right with the People. Nick avowed his love for Rose--but will he ever be willing to sacrifice modern life for her? Meanwhile, Rose's older sister, Hen, is living in her parents' Dawdi Haus. Her estranged "English" husband, injured and helpless after a car accident, has reluctantly come to live with her and their young daughter during his recovery. Can their marriage recover, as well? Is there any possible middle ground between a woman reclaiming her old-fashioned Amish lifestyle and thoroughly modern man? If you would like to read the first chapter of The Mercy, go HERE.